Good Choice Reading: Getting Lucky Number Seven Blog Tour: Review and Author Interview! 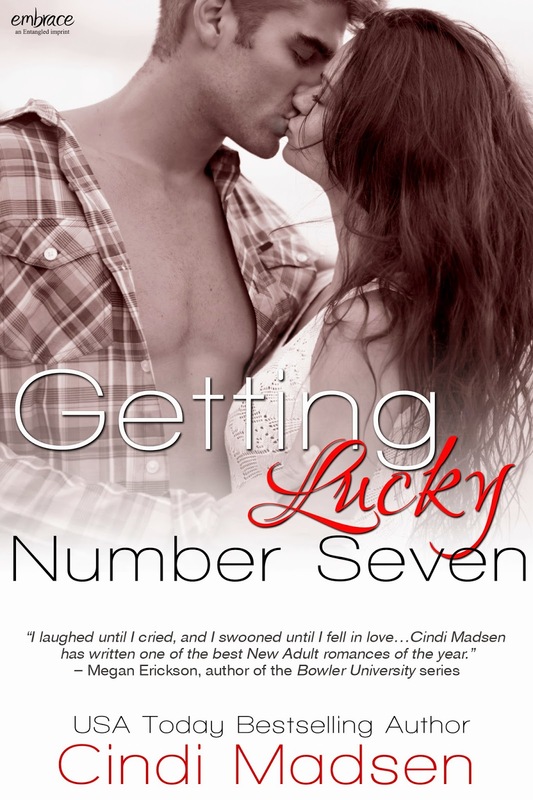 Getting Lucky Number Seven Blog Tour: Review and Author Interview! Beck and Lyla are good friends. When Lyla runs away from a disasterous date (kind of), she decides enough is enough and enlists her good friend, Beck, to help her out with becoming someone new and having a little bit of fun in college, instead of being regular ol boring Lyla. I liked Beck. I didn't really get the man-whore feel for him, though. I mean, sure, he liked some casual, no strings attached activities once in a while, but he wasn't out giving it to anyone that wanted a piece of the action. He was also a super good friend. I mean, he'd have to be to let her convince him to go shopping with her. I liked Lyla as well. She was a big nerd, and well on her way to becoming a cat lady...even if she only had the one Einstein. She also loved her a good chemistry joke. Definitely a nerd, but a fun one. Getting Lucky Number Seven was a fairly light read. Not too heavy on the drama, and there was good chemistry between the characters. Also, there was a lot of great banter between Lyla and Beck. I enjoyed the story, and if you like hockey talk, and friends to lovers romance, then you would enjoy it too. Getting Lucky Number Seven is about a shy chemistry nerd who is sick of spending all her nights with her cat, so she recruits her hot hockey playing friend to help her make and check off a bucket list. The more they do together, the more they notice things they haven’t before, including the fact that they’ve got quite a bit of sexual chemistry. 2. What's the one piece of technology you can't live without? My iPhone. I get twitchy when I accidentally leave it. Yes. Often I know which ones are gonna bite it before I write the book and sometimes it takes me by surprise. In both instances I get so attached that I try to talk myself out of offing the poor character. 4. How many times were you turned down for a book offer before you finally got published? Countless. My first book that got published was actually the 12th book I’d written. I kept trying to give up, but then I’d get a new book idea. And then I decided that I’d just keep writing until one hit, and just when I was starting to question if it’d happen, I contracted 2 books within a week of each other. 5. Do you think they regret turning you down now? Of course that’s the hope, right? That all these people who turned me down are in their offices saying, “Why?” I doubt most of them even remember that they did, but honestly, as hard as it was to deal with the rejection, the dynamic between a writer and their editor & the difference it makes when the editor loves a book is worth waiting for. That was one big thing I learned during the editing process, and I know the way we work together has helped me be more successful. 6. What scene was your favorite to write? All the kissing ones. I love writing kissing scenes. 7. What scene was the hardest for you to write? The scenes where everything falls apart between the characters always take a lot out of me. Coffee or Tea? Mtn Dew.